Kingmax has implemented its 9 Stacked Die technology to create the world's largest capacity microSD card: 64GB. The microSD card complies with the latest SD3.0 and Class 6 specifications and is also compatible with SD Card Association's SD2.0 specification. Although it comes in a compact size (15mm x 11mm x 1mm), it will very likely satisfy your needs for massive multimedia data storage, including high-resolution video clips or photos, MP3 files, mobile games, or multimedia downloads. 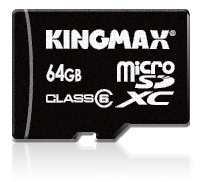 Moreover, with the help of an adapter, Kingmax's microSD card can also be used as an SD card or a USB flash drive. This means you can use it with anything from digital cameras, to multimedia players, to PCs, to PDAs, to card readers, and to printers. Kingmax's microSD card also has a built-in Error Correction Code (ECC) which acts through a controller to auto detect and reconstruct lost data during transmission to ensure reliable data transfer. In addition, the card comes with Wear leveling algorithm function which allocates all the information into different areas in the memory card to increase each area's average usage and help maximize product lifetime. All of Kingmax's microSD cards have been approved by multiple safety and environmental standards including CE, FCC, and RoHS; they have also been certified as being compatible with major operating systems. Last but certainly not least, Kingmax offers a lifetime warranty for all its microSD products. Pricing and availability have yet to be announced. It shouldn't be too long now, given that Kingmax likely doesn't want to wait around and let another manufacturer swoop in and offer a 64GB microSD card first.